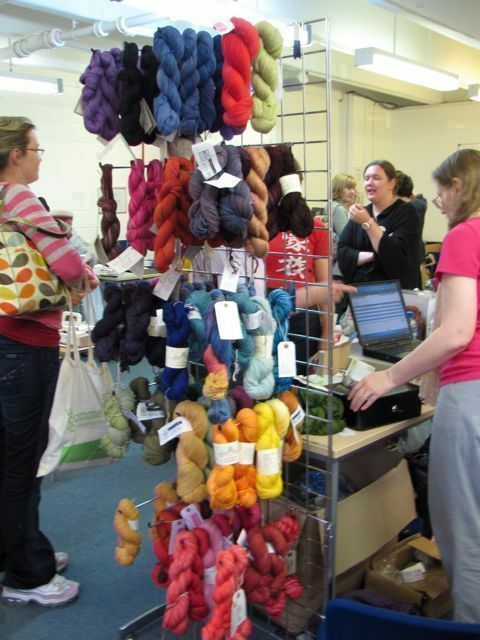 UK Knit Camp, and How We Learn | Knit Like You Mean It. NOTE: Due to technical oddities, I am blogging from my iPad. That means the formatting isn’t very nice, and all photos appear at the bottom of this post. Many apologies! People, I have been to the promised land. 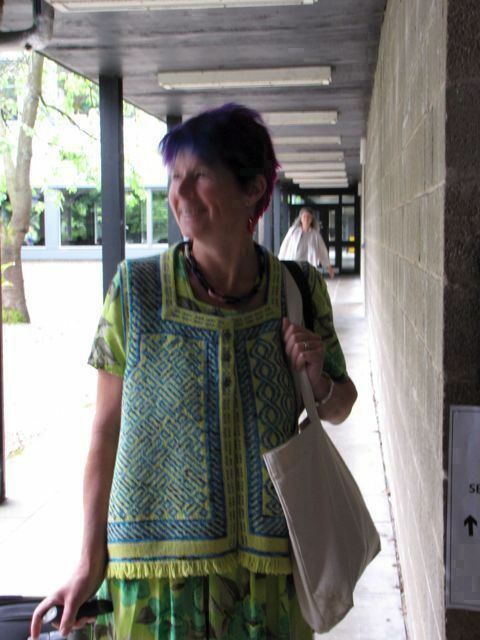 With the help and support of my trusty husband, Mr. Trask, I flew to England…I took the train to Stirling, Scotland…I took the bus to the University of Stirling…and I walked right on into UK Knit Camp. And it was good. Let me rephrase that: it was glorious. Just a few years ago, Brenda Dayne was lamenting the fact that there were no knitting gatherings in the UK like the Knit Camp that Elizabeth Zimmermann founded in the US in 1974. What Brenda wants, Brenda gets…just a few years later. 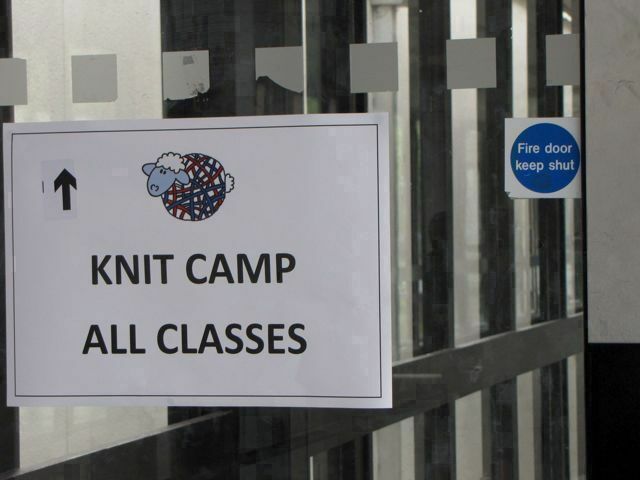 I was, I will admit now, a little worried about UK Knit Camp. Mr. Trask has been so very nice about it, finding us a hotel and encouraging me to drop in the very day we arrived, reassuring me that he was happy — nay, EAGER — to run around Stirling Castle and the Beheading Stone without me, reminding me that he enjoys sitting in coffee shops and reading, even telling me he knew that I’d be buying yarn there. With all this understanding buoying me up, is it any doubt I would end up shriveled in a corner, talking to no one, weeping into my expensive and irrational yarn purchases? (I have no doubt this kind of insanity is limited to my brain. You would be much more sensible about the whole thing.) I would have to hide the disappointment from him, keep a stiff upper lip, and say that I’d made tons of friends and all the yarn I’d bought had a purpose and could never be purchased elsewhere. 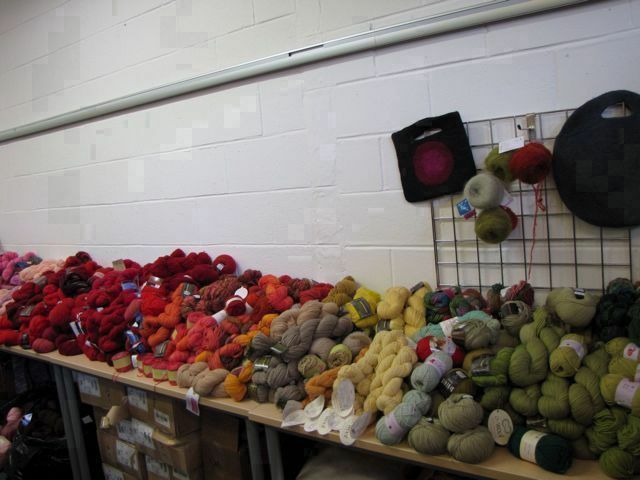 Soon enough, I was in the Knit Camp office, which featured a whole mess of yarn and nice ladies to help us. This was where things got exciting for me, and sad for my wallet. Look how nice the yarn was! See how it all wanted to come home with me? See how much of it there is? 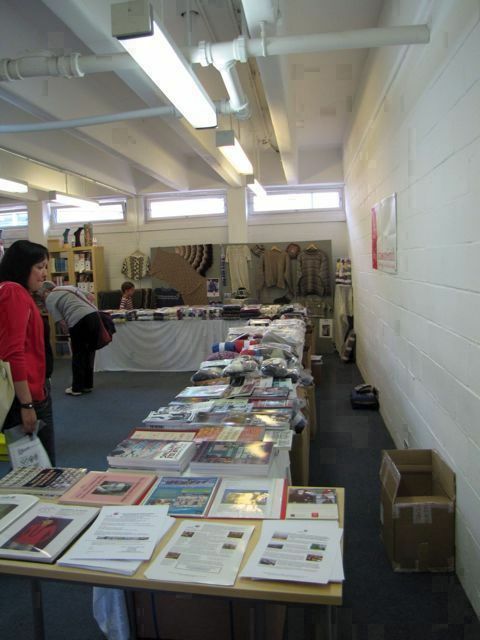 And…around the corner there…is that Jamieson and Smith?!? I didn’t stay for the full week, much as I would have loved to. I did take a class with Jared Flood. It seemed a little silly to take a class from him when I was all the way over here, but his was the class with information I needed, and who could ever get enough of Jared, anyway? I learned so much in just a few hours. I’m often amazed at the oral tradition of knitting: there are still techniques floating around out there that can only be found in one or two fairly obscure books, and that most of us learn from demonstration and hands-on experimentation rather than how we learn most things: by reading. In this case, I learned (drumroll) how to reinforce the edges of a steek using crochet, and then how to cut that selfsame steek. Amazing, right? Miraculously, I am considering steeking for real sometime soon. Both Jared’s Rockaway cardigan and Mason-Dixon’s glorious Baby Dotty blanket seem possible now. That would not have happened for me had I simply read about the technique. What about the rest of you? Do you learn better by reading or by being shown how to do something? Is the same thing true in knitting as for other things (like, I don’t know, cooking? Math?)? And finally: those of you who have been paying attention will have noticed that Mr. Trask and took a meandering route up here (Oxford to Carlisle to Stirling to Pitlochry, with several train changes in between). To retain the savings of our round-trip tickets, we will be dashing back down that route tomorrow. In the brave spirit of Knitting Like One Means It, during our 9+ hour journey I will try to start and finish a scarf made of yarn purchased in Scotland. I’m swatching tonight; stay tuned for the results! I personally find it easier to be shown how to do something rather than following written directions or diagrams. A friend and I taught ourselves how to knit at a coffee shop surrounded by books containing written instruction, as well as photograpic and illustrated directions. I’m certain I don’t knit in any standard method! This has really gotten me to thinking and, since I’m not at work, this comment may wend a bit on its way to completion. In my next position, I was blessed to meet the authoress of this blog (the blogess?) and she taught me how to knit. Again, she used my hands to do so, while also patiently demonstrating using her own (over and over and over again) what mine were SUPPOSED to be doing. In time, I got the hang of it sufficiently to make a pair of socks (whose size and gauge did not quite match), a hat, and a couple of scarves. While I’m nowhere near “good,” I’m able, and that is sufficient for my purposes at this point. I have the ability now to research and read more about things I want to learn how to do. And I usually find that when I consult an online video, the ah-ha moments come fast and furious. When I think about cooking (I readily admit my addiction to cooking shows), I realize that again, I learn visually. I watch and then mimic skills learned by seeing (vicariously doing), and read more about the topic in books or online. In sum, I believe I learn best by DOING or seeing and then reading further to reinforce, expand upon, explore new things. I think it depends on what I’m trying to learn. Another novice and I spent hours on the couch with a few knitting books – making a huge, tangled mess – when I first tried knitting. It eventually came together. I figured out how to knit and purl with diagrams and words, but an accomplished knitter’s hands-on help made a tremendous difference. So very jealous of your camp experience! This is an interesting question although the question that has burning in my mind is “How can I get to Knit Camp?” Knitting is something I never ever could have learned out of a book, it would have completely frustrated me. I love to read but knitting has required seeing, doing, asking for help, and just in time tutorials. That necessarily involves people, well mostly other women to be precise, and I think the connections that have grown out of this process has been the biggest surprise. In fact, I’ve become more confident and fearless in taking on projects and much more calm in the face of stitch calamity because I know there is always someone I can go to for help. Oh, the internet has helped too, both for how -to-stitch videos and visual inspriation. Both fall into the category of seeing rather than reading in my mind. Initially, I like to be shown how to do something. By a person. However, once I am comfortable with the basics, I like to challenge myself by figuring out how to do more. I like watching videos of people doing things, but I can also usually follow written instructions or use a drawn diagram. There is an exception for me though. Yoga. I NEED someone guiding me through postures. Otherwise, I slack.